We were looking for a quick and easy getaway from Berlin – to get a bit of sun and sand (assuming the sun would cooperate). I was skeptical about going up north. I really couldn’t imagine Germany having beautiful beaches – I mean, if Germany had its own beautiful beaches then why are the Germans always flocking to Mallorca and Malaga in Spain? We decided to give it a try anyway- the weather has been unpredictable this summer so in case the beach didn’t work out, at least there were a few beautiful towns with medieval architecture nearby. We decided to try Rugen Island although we had also heard great things about Usedom Island. 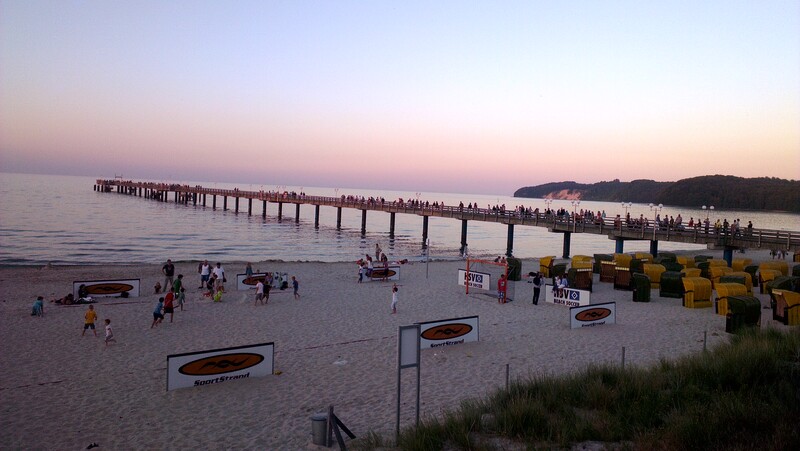 There are a few towns/beaches to choose from on Rugen – the main 3 being: Gohren, Sellin and the most well-known, Binz. We opted for Sellin as it seemed to be a bit quieter than Binz but still with a beautiful beach. 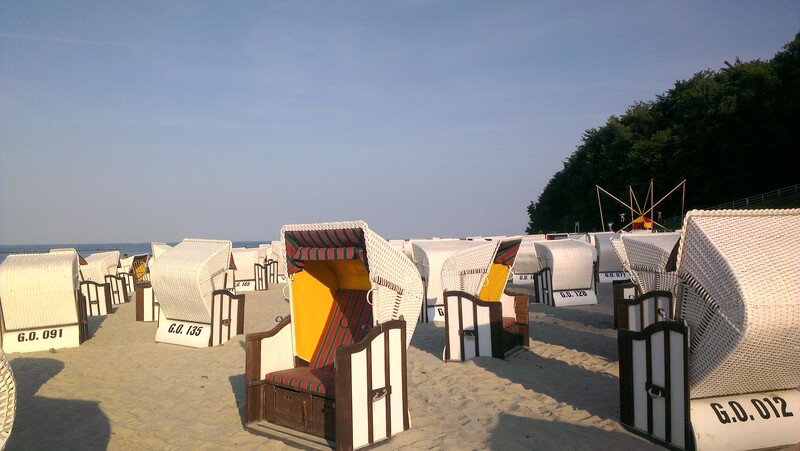 Although it was super last minute and the peak of the tourist season in Germany (school is out for the kiddies and everyone is taking their summer vacation), we had no problem finding an affordable room at Villa Subklew just steps from the water. After a 2 1/2 hour drive – a bridge conveniently connects the mainland to Rugen Island – we were in Sellin. What a quaint, cozy seaside town! Although clearly a family destination, the beach was beautiful and the little town and restaurants charming. We especially loved the fish stands with their “Fisch Brotchen” – little fish sandwiches of all different kinds, smoked salmon, mackerel, etc. Lunch was affordable for a “tourist” town – a beer and a fish sandwich cost about 6 Euros! The beach has these little huts – cabins that you can reserve per day (around 6 Euros) or per week. I just love how organized the Germans are! But remember, if you want to get one of these for the day, you better get there as soon as they open up shop otherwise you may be out of luck! The next day we headed to Binz – only about a 10 minute drive from Sellin. Definitely way more developed and way more people. Although we didn’t have a place booked, it only took 15 mins or so of inquiring to find an available room, even during peak season. Prices were a bit higher and Binz had less of the quaint, seaside town feel to it. 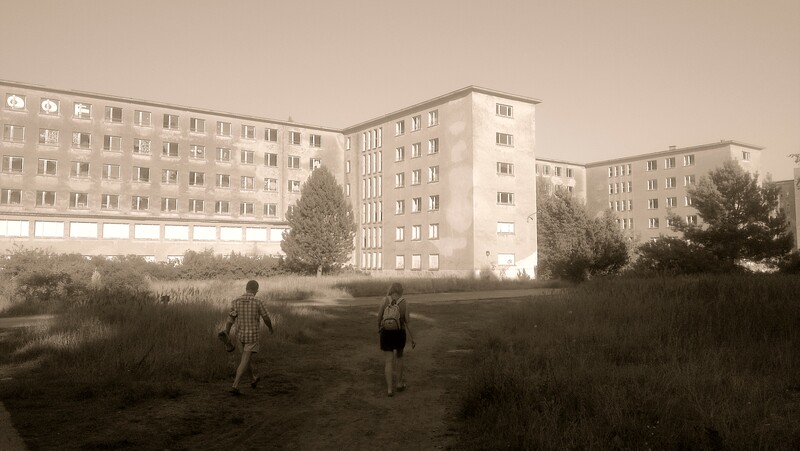 After having another lucky sunny day at the beach in Binz…and surviving all the kids running around – we took a little detour on our way home to check out the remnants of an eerie Third Reich Building in Prora (about a 10 minute drive from Binz). The concrete, eerie housing blocks stretch out along a beautiful beach, providing quite the contrast. The Prora Resort was built by the Nazis around 1936-1939 and was meant to be a holiday resort for the average working family. The intended capacity was 20,000 people and each room had a view of the sea, making the entire building over 4 kilometers long! It was never finished due to the start of the war. More recently, it has been used for some random purposes – housing soldiers, housing refugees, etc. but it just sort of sits there crumbling away. 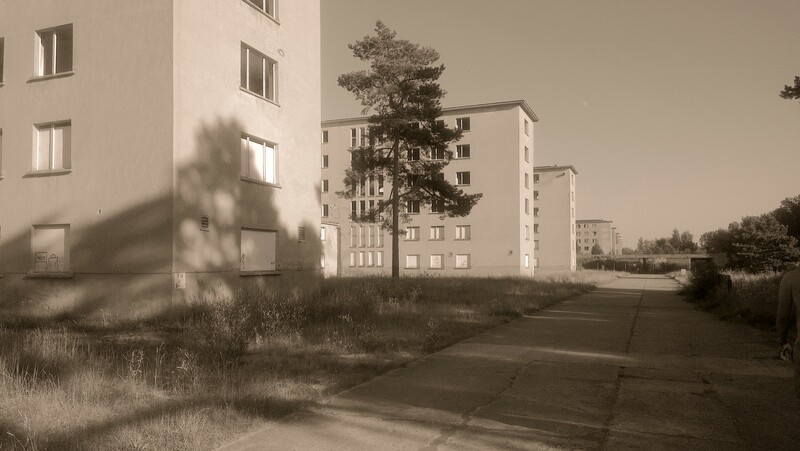 Recently one of the housing blocks was made into a youth hostel but the rest of the buildings are abandoned. I think you used to be able to wander inside the buildings before but they’ve now boarded everything up. Sort of a dilemma as to what you can do with these buildings – tear them down and deal with cleaning up all that concrete? Or leave them there as an eyesore on an otherwise beautiful beach? Or renovate them into a cool, new hotel but renovating an old Nazi building is also a bit of a touchy subject…guess we’ll just have to stay tuned. Either way, with that we hopped into the car and were back in the heart of Berlin in 2 1/2 hours! Love how close interesting things are in Europe!